Home News Civil Society and Beyond: A Joint Dialogue on the European Path – What did we learn? Civil Society and Beyond: A Joint Dialogue on the European Path – What did we learn? 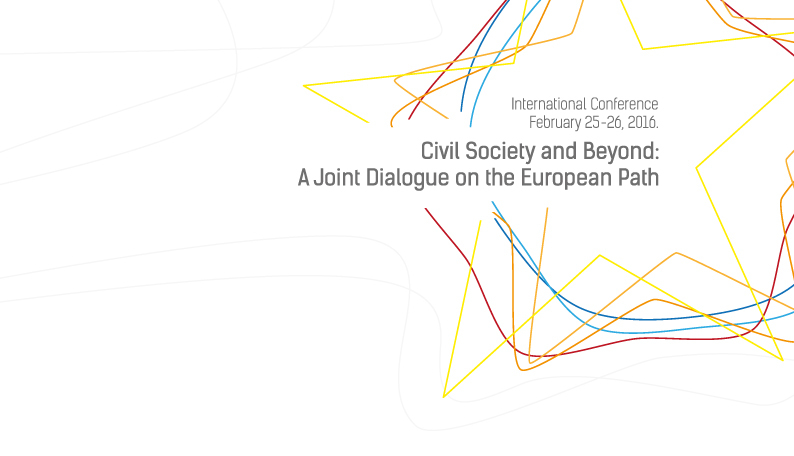 The two day International Conference “Civil Society and Beyond: A Joint Dialogue on the European Path” was organized on February 25-26, 2016 by the European Movement International and European Movement in Serbia, with the support of TACSO P2P and in partnership with the Serbian European Integration Office. You find the documentation here. The purpose of the conference was to create an opportunity for stakeholders from different countries from the Western Balkans and Turkey (WBT) to exchange perspectives and experiences with regard to the role of civil society in the European integration, as well as to work on the mechanisms for strengthening bilateral and multilateral cooperation among CSOs in the WBT region and the EU. The event gathered 155 participants from civil society from the EU, the Western Balkan and Turkey region and Serbia, as well as from European institutions and national authorities from the region, and attracted significant media attention. Thanks to all members of Citizens For Europe, who participated in this conference by answering our call! With your insights, the network will grow further and others will profit from your experiences. “As a student in journalism, covering a major european conference like this one in Belgrade, was a very interesting experience, as much in terms of contents and details than meetings. Regarding this year congress’ topic, I now understand how fundamental and primordial the development of the civil society in the Balkans countries is. […] It’s effectively always stimulating to have access to a variety of different points of view. Obviously, the very ideas behind the european project can vary greatly from people living in Balkans to those living in the « old european » countries.